In this process, maple syrup is heated as it passes through a steam heat exchanger, then enters an evaporator where the water boils off. The purpose of this is to raise the sugar concentration of the syrup, making it suitable for use as a food topping. 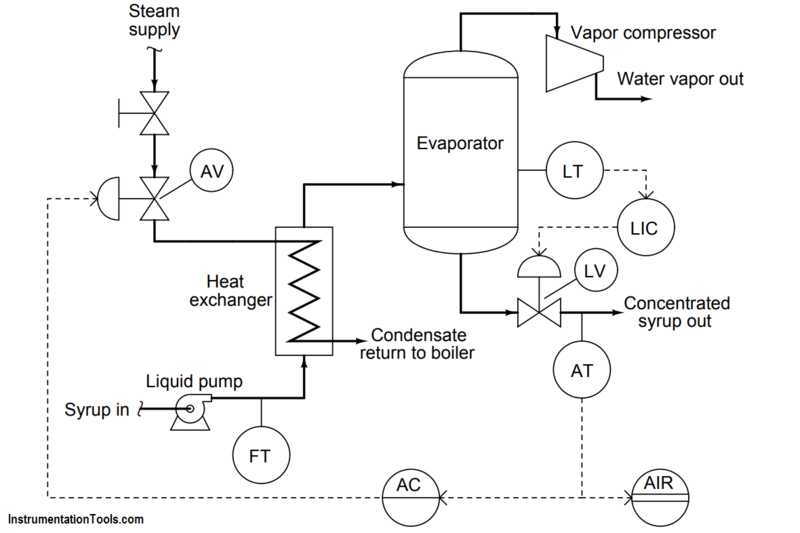 A level control system (LT, LIC, and LV) maintains constant syrup level inside the evaporator, while an analytical control system (AT, AIR, AC, and AV) monitors the sugar concentration of the syrup and adjusts steam flow to the heat exchanger accordingly. Suppose the syrup analyzer (AT) suffers a sudden calibration problem, causing it to register too low (telling the analytical controller that the sugar concentration of the syrup is less than it actually is). Describe in detail the effect this calibration error will have on the performance of the analytical control system. What economic effect will this mis-calibration have on the process? In other words, does the process become more or less profitable as a result of this change? Suppose someone shuts the manual block valve on the steam line just a little bit, so that it is about 80% open instead of 100% open. How will this process change affect the control systems in this process? The syrup’s sugar concentration will eventually become excessive as the analytical controller (AC) attempts to maintain setpoint. Identify High Flow Alarm and Low Flow Alarm ?